Number one in Texas when it comes to entertainment, Arlington is the perfect choice for anyone spending a great vacation with the family. Visitors love Six Flags Over Texas and the excitement of the Hurricane Harbor, and with fun shopping areas and historic homes, Arlington has something for everyone. Arlington even has plenty of choices when it comes to selecting a holistic dentist in the city. Choose from an orthodontist, periodontist, general dentist, or a dental surgeon when a dental emergency sends you seeking relief. The Emergencydentistsusa.com website is a perfect starting point in your search for a new holistic dentist. Simply scroll through our hand-selected listing of great Arlington holistic dentists and click on the dentist who provides the services that you need. Find dental office hours, driving directions, and even insurances accepted right on our friendly website. All of the Arlington holistic dentists are easy to access when all of the information is right at your fingertips. When you do not have access to the internet or need a little more help choosing a new holistic dentist, our 24-hour toll-free dentist finder hotline is waiting for your call. Speak with a friendly agent who can give you information about each dentist, driving directions to the office, and can even set up your first appointment. Remember to bring your dental insurance card, photo ID card, and any necessary copayment with you to visit your new dentist. Arrive at least 15 minutes early to fill out the new patient paperwork. The city of Arlington is a great place to be when you have an unexpected dental problem or simply need a new holistic dentist. Scroll below to see the top three holistic dentists in Arlington. Description: Providing you with TMJ management, sleep apnea services, and even with information regarding organic foods, Pride Dental is determined to promote whole-body health. 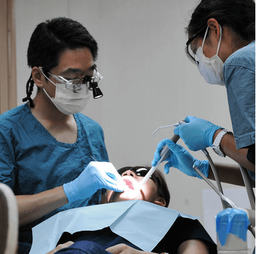 Two caring dentists work together to perform general dentistry, safe mercury removal, cosmetic dentistry, and even fillings, implants, and crowns. Striving to provide patients with education and service, Pride Dental is a favorite in the Arlington area. Description: With sedation dentistry available for anyone who worries about dental treatments, Dr. Macalik really caters to her patients. Located in the heart of Arlington, this caring dental office provides general dentistry, cosmetic care, restorative services, and dental surgery in a single location. A kind staff makes each visit a pleasure and Dr. Macalik is committed to your whole-body health. Description: A caring dental staff and a friendly doctor make Apple Dental Center a great place for anyone seeking holistic dental services. Using biocompatible materials and creating dazzling smiles, Apple Dental Center offers patients a huge selection of services. Convenient office hours are provided so that you can visit the dentist without losing a whole day at work. Choosing a new holistic dentist does not mean that you have to begin your dental care all over again. A holistic dentist provides most of the same services of a standard general dentist but uses products and materials that are biocompatible and that create less of an impact on the environment. Becoming more aware of the materials that are used in your dental services means that you are paying attention to the health of your entire body. Holistic dentists offer options like biocompatible mercury-free fillings, low-dose x-rays, and Zirconia porcelain crowns. When you choose your new Arlington dentist, it is important to ensure that he or she is properly licensed and credentialed to perform dental services in the state of Texas. You can find this information by accessing the Texas Dental Association website. Select the search box, and enter your new holistic dentist’s name in the search box. View the most current licensing documents right online. You can also visit the dental office itself to take a look at these documents. Just speak with the dental receptionist prior to your first appointment.